"EventPro is ALL I use!" I like that it is intuitive, and that the information is available in several different screens. I LOVE their customer service. When I call I get to talk to a live person and they stay with me until the problem is solved. I have used this software for 8 years, and I typically speak with the same people when I call. They have also customized different reports and solutions based on my specific needs. I have the new Inquiry module, and there are too many steps to turn a previous inquiry into a booked event. This is great for event venues that have multiple spaces and many people booking events. Definitely the customized reports. I have several different sales people and costs, I can decvelope reports that spit out exactly what I need. "Use for conferences & meetings as a conference manager"
Each to use for searching delegates details and events they are attending within a conference and/or trade show. 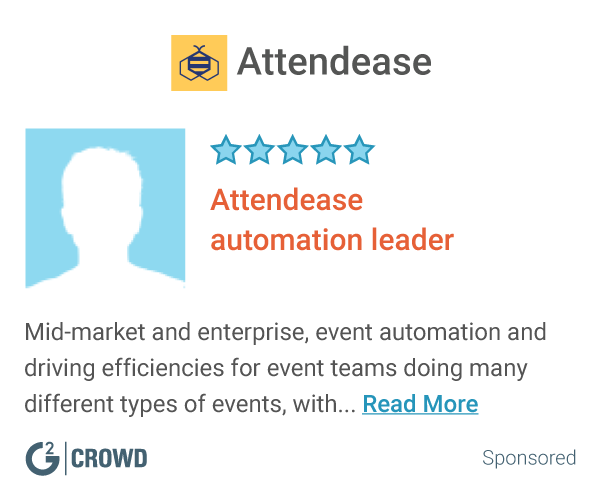 Easily able to add tickets to a delegates profile for functions happening throughout the Conference and/or trade show. Can add abstract topics and change authors, add in session times and exact presentation times. A little bit cumbersome for abstract submission and replacing abstracts. Can be a little hard to search for some things. Can be a little clunky to use sometimes. Slow depending on your internet connection. Exporting can take a while if you have a lot of abstracts. Look at ease of software implementation and how easy it is for new staff to pick it up and the cost of ROI to your business. Events Pro is a particularly good program for plenty of abstract submissions and updating programs with very intricate level of details. Trying to make the registration process as streamline as possible which can happen if you have good training and great customer service teams. It's great to remove the use of excel documents to run events and making it easier to bulk upload and change. "Excellent calendar, but a little outdated"
The calendar is amazing. User friendly and really customizable. Plus it updates live so our entire department could view the same calendar/information. Occasional glitches in the system, but their customer service is excellent and quick to respond to tickets. Somewhat visually outdated. Keeping our entire department on the same page. Love the customization. "I used this for booking and processing all events on our college campus. " The only problem we ran into was someone had to have the program to see events scheduled. It's a great tool especially when planning events. Everything you need is in one program and it is simple to use. * We monitor all EventPro Software reviews to prevent fraudulent reviews and keep review quality high. We do not post reviews by company employees or direct competitors. Validated reviews require the user to submit a screenshot of the product containing their user ID, in order to verify a user is an actual user of the product. Hi there! Are you looking to implement a solution like EventPro Software?